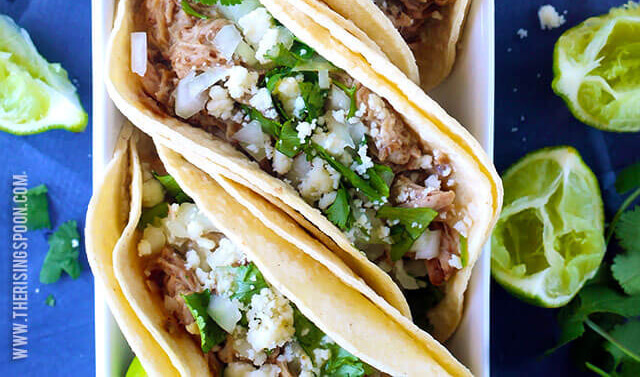 Imagine soft corn tortillas filled with tender, slightly crispy, and juicy shredded pork carnitas, chopped onion and cilantro, crumbled Mexican cheese, and a squeeze of fresh lime juice. Are you salivating yet? 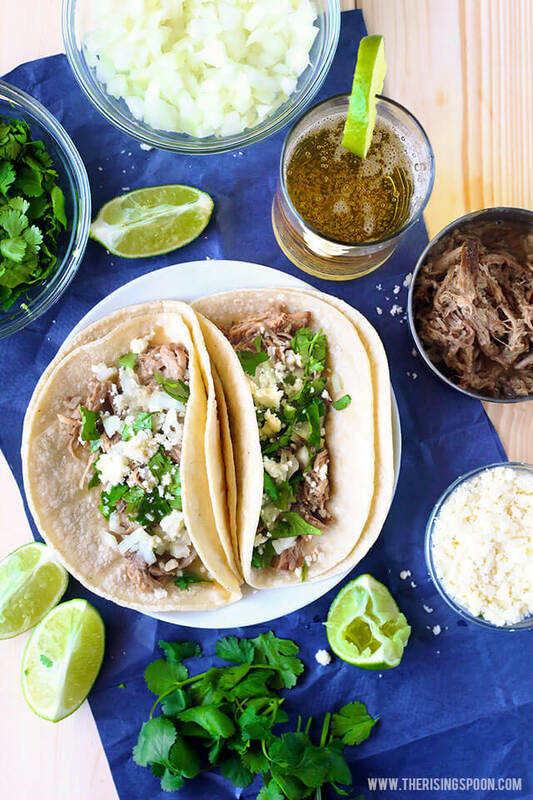 Carnitas tacos are perfect for a quick weeknight meal or even a large gathering where you need to feed a crowd without breaking the bank. Make some today and your belly will thank you. 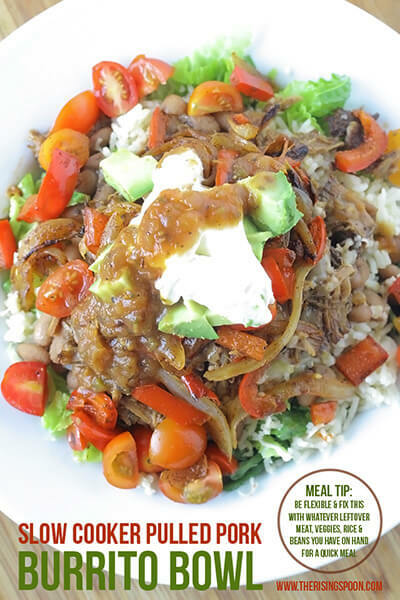 Let me introduce you to one of my favorite comfort food meals of all time: street-style carnitas tacos. Never heard of them? Boy, you're in for a treat! This is a particular type of taco served at tiny (often hole in the wall) taquerias all over the southwest. 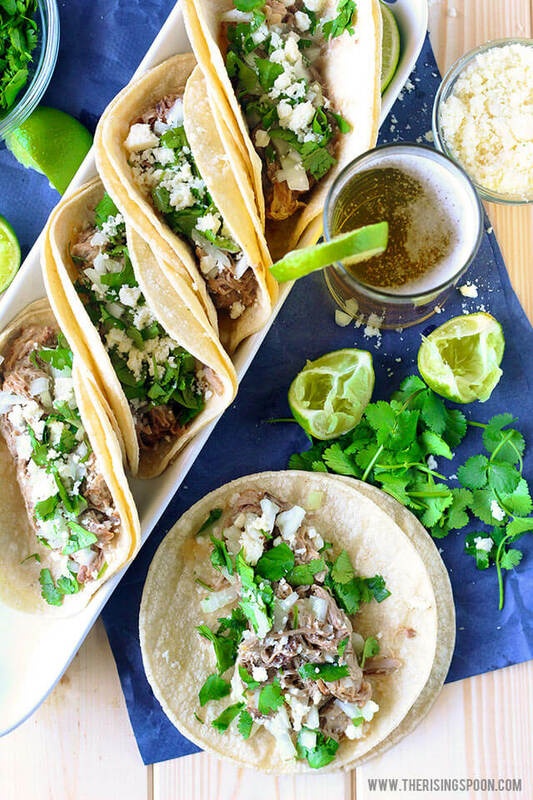 Street-style tacos consist of small soft corn tortillas filled with juicy & crispy meat (my favorite is pork) that's topped with finely diced raw onion and cilantro and served with a side of lime wedges, salt, and either red or green sauce. I've been eating street-style tacos for almost 10 years now and was first introduced to them in 2007 by my boss (back then) who is from Belize. She came into work one day with steak tacos (we worked at a bagel shop), but instead of dumping sour cream, canned nacho cheese, and generic taco sauce all over them (American or Tex-Mex style), I noticed her carefully sprinkling on salt and squeezing fresh lime juice over the tacos. I was sooooo curious, so I asked her a bunch of questions and she laughed and explained to me that everyone back home ate their tacos this way. Fast forward a year to summer 2008. My beau graduated from art school and within a few months landed an internship at a gaming company in Rockwall, Texas. I helped him move from Kansas City to Texas in the sweltering heat and thus began a 4-year long distance relationship while I finished community college and then pursued a degree in English + Creative Writing at UMKC (in case you're wondering, I love reading & writing, but I'm not a grammar nazi). Rockwall is a small city on the outskirts of Dallas, so the beau didn't have many options for eating out (he rarely cooked). 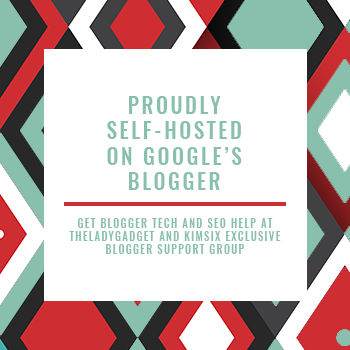 Whenever I flew down to visit (every six months or so if I was lucky), I tried to fix meals from the local grocery store, but that gets expensive when there's nothing in the fridge or pantry to work with, LOL! So we'd eat out. I didn't want his go-to meals of Dominos & Subway (uhhh...no thanks), so I often asked for tacos! I lived in the BBQ capital of the world and didn't get a lot of authentic Mexican or even good Tex-Mex food, so I craved it like mad. This was when I had my first street-style chorizo & pork tacos and grilled avocados covered in queso. One word for both: ahhhhhh-mazing. When I moved down to Texas in 2012, I was ecstatic to be reunited with my beau and those damn good tacos. Sure, I missed my Kansas City barbecue something fierce, but Dallas is full of taquerias to console me whenever I'm struck with homesick BBQ cravings. 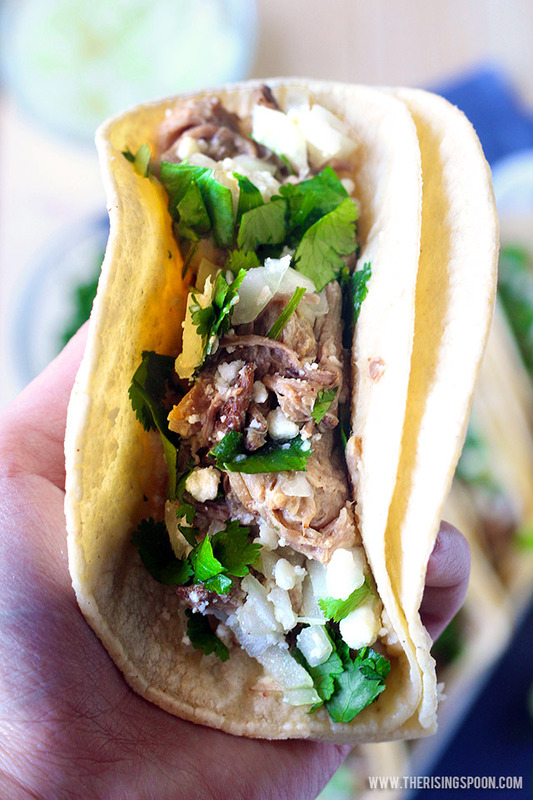 Since I was bonafide obsessed at the time, street-style carnitas tacos were one of the first recipes that I shared here on The Rising Spoon back in 2012. I've never tried to replicate those glorious green and red sauces from the taquerias, but I got the slow cooked juicy/crispy meat + all the fixings down pat. And while I've made pork carnitas & chorizo tacos a bunch of times with only the onion, cilantro, lime & salt...this time around I included one of my current obsessions--cotija cheese--to jazz things up. I'm fully aware that authentic street-style tacos DON'T have any queso (cheese) on them, so this is totally optional. Crumbled cotija cheese adds a wonderful texture and salty taste that pairs perfectly with street-style toppings, in my opinion. You might be wondering why I didn't include the instructions to fix the pork shoulder in this post (like some other recipe creators & food bloggers do). Well, the main reason for this is because slow-cooked pork shoulder yields A LOT of meat. If you choose one big enough, you'll typically have leftovers for a week + extra to freeze, depending on the number of people you're feeding. For this very reason, some folks cook it to serve at large gatherings because it will feed an army and it's budget-friendly. I'm not having any backyard parties (2nd-floor apartment) and as much as I luuuuuurve tacos when I fix a whole bunch of carnitas, I use the succulent meat for many other dishes like enchiladas, burrito bowls, BBQ pulled pork sandwiches, scrambled eggs, potato hash, soup, and nachos. 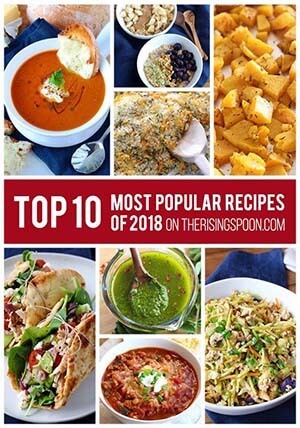 So I shared them here as separate recipes. 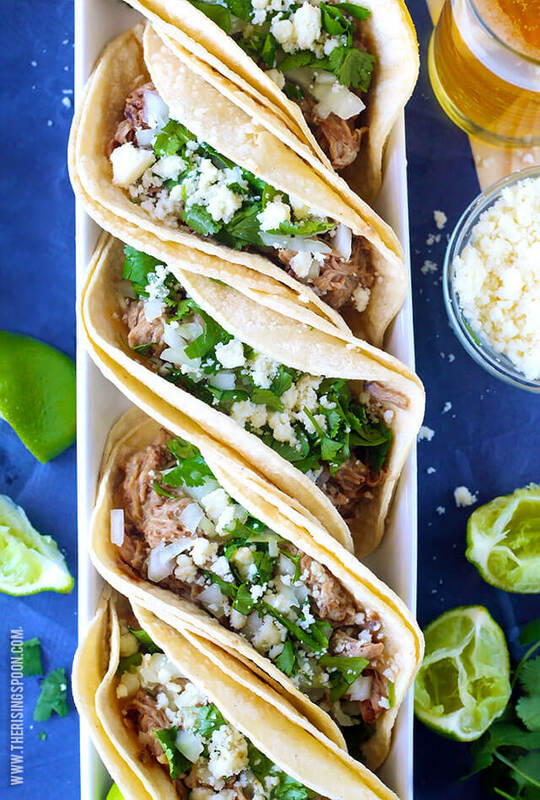 If you want to use my carnitas recipe as the base for these tacos, grab my slow cooker pork shoulder recipe here. It's super duper easy (the crock-pot does practically all the work). You'll just need to plan ahead so you have about 4-5 hours on high or 8-10 on low (depending on the size of your meat) to get the pork tender and shreddable for the tacos. From there, it's just a quick chop for the onion, cilantro & lime, warming up the tortillas, and assembling everything for a fast meal your belly will love! I like to serve my tacos with a cold Cerveza or blood orange margarita (an horchata is a refreshing non-alcoholic option that's easy to get at taquerias), but sometimes fix a batch of coconut lime rice and slow-cooked pinto beans on the side for a super filling meal. 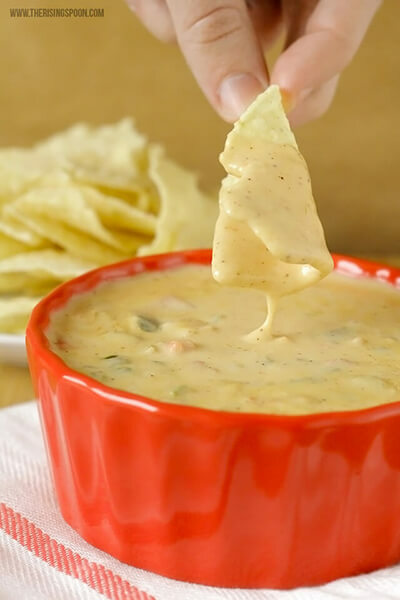 Of course, if you're celebrating Cinco de Mayo and want to go all out, make a batch of homemade queso dip along with guacamole, 7 layer bean dip, and a tomato or fruit salsa (like mango avocado salsa or fresh peach salsa) to serve with tortilla chips. ALL THE FOOD!!! 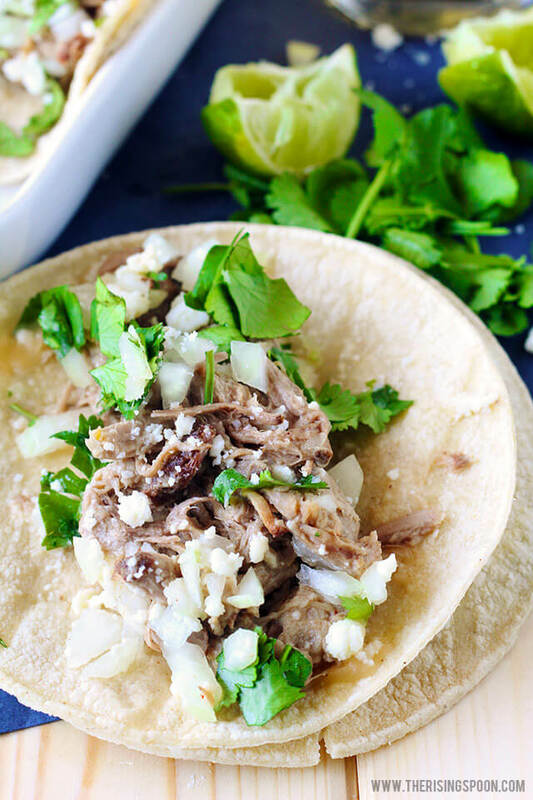 Soft corn tortillas filled with tender, slightly crispy, and juicy shredded pork shoulder (carnitas), chopped onion and cilantro, crumbled Mexican cheese, and a squeeze of fresh lime juice. 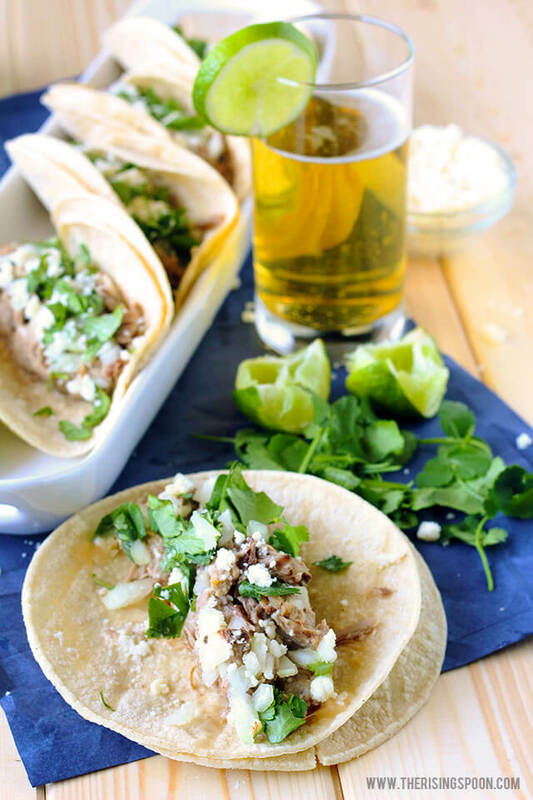 Carnitas tacos are perfect for a quick weeknight meal or even a large gathering where you need to feed a crowd without breaking the bank. 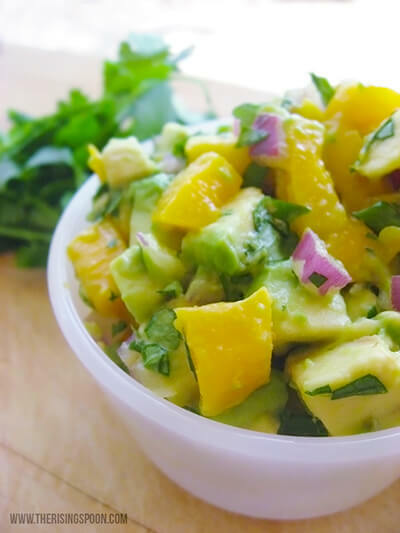 Make some today and your belly will thank you. *Note: If your pork is extra juicy or you plan on adding a runny salsa, double up your tortillas (24) so they hold the ingredients better and the tacos don't fall apart. When the tortillas are warmed, cover them and set aside. Prep the onion, cilantro & limes (this should only take a few minutes), then add the cooking oil to a skillet set to medium heat and when it starts to just shimmer, add the shredded cooked pork shoulder. Spread it in an even layer and let it cook for a few minutes to let the outside form a brown, crispy crust. From here, I will typically leave one side crispy and the other side soft so the meat stays juicy, but you're welcome to flip it and crisp up both side if you want (you may need to add some more drippings from the meat to keep it moist afterward). Time to assemble the tacos! Grab 1 tortilla (or 2 if you want to double them up) place about 1/4 cup of shredded pork in the middle, garnish with onion, cilantro, and cotija. 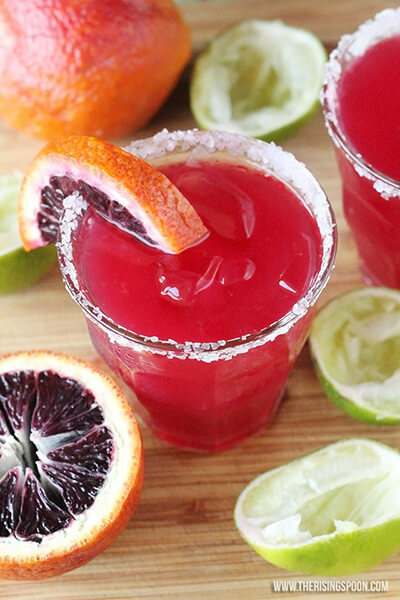 Repeat until all the tacos are done, then serve each portion with several lime wedges and pass the sea salt for everyone to sprinkle on themselves. 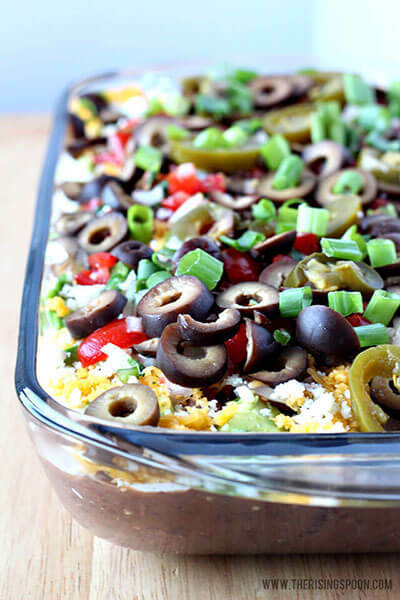 Serve immediately with your favorite sides, like rice and beans. What's the best taco you've ever had?